Open any file in your project, such as a drawing file or an assembly file. Invoke the command from the tools menu. You will be able to see a tree representation of every file referenced directly or indirectly by the current file. Picking on any item in the tree will allow you to browse the properties and even edit them without leaving your current file. You can even edit the virtual items in your assemblies. Switch to batch mode, pick the files that you want to edit and then set your standard and custom iproperties for all the selected files in one operation. You can also remove user defined properties from all files. Updated! Two new usability enhancements. First, when you navigate between files in the model tree, it remembers which property set and property that you were working with and sets the focus to that property. Use the [ctrl]-[arrows] key combination to navigate to different files without moving away from the keyboard. 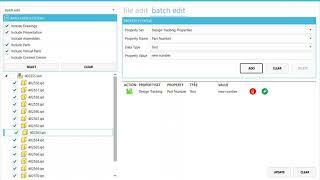 Second, when in batch mode, you can now remove user defined properties, not just add or update properties. Look to the icon beside the property to indicate which operation you are performing with that property.